One of the biggest problems that many face with their teeth is the yellowish discoloration that occurs over time & makes your smile less appealing. People who smoke, drink lots of coffee or soda, and individuals with genetic predispositions for tooth decay can experience tooth discoloration quicker & more severely than those who do not. Cosmetic dentistry has come a long way in improving a dentist’s ability to not only maintain a beautiful smile for patients, but to create one as well. Teeth whitening is one of the most common dental procedures performed throughout modern dentistry. 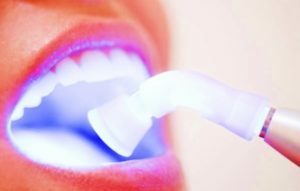 There are many ways to whiten your teeth, but professional whitening by a dentist is the quickest and often most effective method of restoring the pearly white glow to your smile. At Carson & Carson DDS, we have whitened thousands of teeth over our 45 years serving Ventura County. Call today or make an appointment or speak with an experienced dentist about how whitening can improve the color of your teeth at (805) 983-0717. Experience the quality of dental treatment from the Oxnard Dentist with over 45 years of serving Ventura County in Cosmetic Dentistry – Carson & Carson, DDS. Although it is almost always possible to improve the color of teeth by at least a few shades, it is not always possible to return natural teeth to their pearly white glow. Results do vary from person to person, and your mileage will depend mostly on what is causing the discoloration of your teeth. Using Tobacco: tar & nicotine stain and discolor teeth over time. Bad Eating Habits: drinking dark-colored liquids such as coffee, cola, tea and red wine, or eating carrots can stain your teeth over time. Acidic foods, citrus fruits, and vinegar also erode enamel aiding in the discoloration of your teeth. Age: The Enamel layer of your teeth wears down over time exposing more of the yellow colored Dentin layer that resides below it. Medications: certain antibiotics, antihistamines, antipsychotics, chemotherapy and neck radiation can cause discoloration of teeth. mouthwashes, gels, strips: Generally, these products use lesser amounts of carbamide peroxide or hydrogen peroxide to lightly brighten layers of the teeth. The time taken to see an effect using over-the-counter- products can be anywhere between days to months depending on the strength of the peroxide. Nonprofessional whitening kits typically have between 10-35% carbamide peroxide or 3-10% hydrogen peroxide. 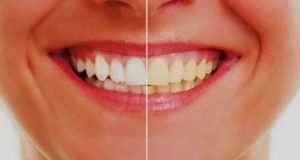 In-Office Whitening Treatments: Professionally applied bleaching products can see concentrations of Hydrogen Peroxide ranging from 15-45% allowing you to see dramatic whitening results in just a single session. Although over-the-counter merchandise can be a cheaper treatment option, professional dental products can have over 10x the bleaching agent in their mixtures and offer a quicker, more controlled solution with less potential for side effects. During your whitening experience, if you observe a difference in the sensitivity of teeth or color gums for a period of time lasting more than a few days, then promptly stop the use of whitening products and consult your dentist. Age: In children 16 and younger, the nerve of the teeth are enlarged and whitening is not recommended. Pregnancy: Because the effects of the whitening agents are unknown on the fetus and the procedure is purely cosmetic, it is recommended to have teeth whitened after pregnancy. Gum Disease & Enamel Worn Teeth: Whitening agents can further aggravate a bad situation if you suffer from issues like cavities, sensitive teeth, or a receding gumline before treatment. Crowns & Fillings: Using a whitening agent on a tooth that’s undergone a restoration such as a tooth-colored crown or filling will have no effect because they are composed of materials that do not whiten. Brown/Heavily Stained Teeth: Dark stains on teeth are far more unlikely to be removed by the whitening process than yellow stains. Ultimately, blue and grey stained teeth may take months and many in-office visits to lighten or may not respond to whitening treatments at all. The two most common side effects from tooth whitening are increased dental sensitivity and mild irritation of the gums or soft tissues in the mouth. Both side effects are mildly felt and short-lived. Increased dental sensitivity is common during the initial stages of the bleaching process and can likely be remedied by: Using a high fluoride toothpaste for 2-3 days to revitalize teeth minerals, breaking from the whitening process, wearing the whitening tray for shorter time periods, or by using tooth paste with soothing potassium nitrate in it. Mild irritation of the gums can be caused from a misfit of the mouthpiece causing bleaching agents to be exposed to soft tissue, but irritation is less likely to occur when getting teeth whitened professionally. The American Dental Association provides a Seal of approval to whitening products that follow ADA guidelines for safety and effectiveness. Mostly, the ADA seal of approval is given to take home whitening solutions dispensed by dentists’ offices because they are paired with crucial professional consultation. It is important to note that no whitening method using a laser is ADA approved. This patient had her teeth whitened several shades whiter than what she started out with. The color speaks for itself. Want to see more of our past work? 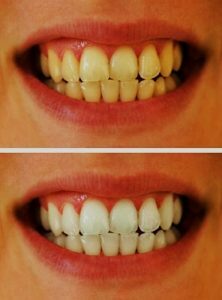 Check out our teeth whitening case studies page. Choosing the right whitening option for you should be done with advice from your dentist. At Carson & Carson Dental office in Oxnard, we treat all our patients with the dignity and respect they deserve. Don’t let the color of your teeth stop you from smiling any longer! Call today for an appointment at (805) 983-0717.